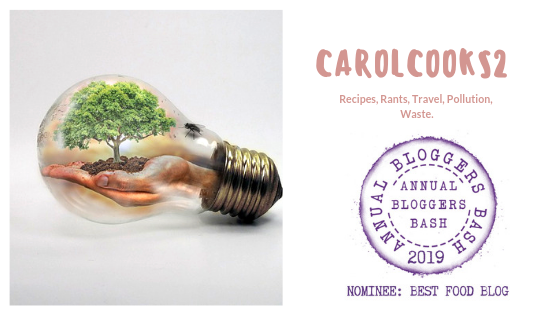 CarolCooks2…Week One… Join me in my kitchen… | Retired? No one told me! When he told me this I was appalled but as he said it is cheaper for manufacturers to add guar gum and the like … for example coconut extract (56 per cent), water, stabiliser (E466), emulsifier (E435), antioxidant (citric acid). E466 is another name for carboxymethyl cellulose. E435 is another name for polysorbate 60. Kitchen Tip: Try to find a brand which only contains coconut milk and water and if you can’t and use one of the other brands be careful not to let the liquid boil as it will separate. Dry roast all the ingredients you may have to do this in a couple of batches depending on your pan but be careful not to burn the spices. Transfer to a plate or dish and allow to cool down before grinding to a powder. Store in an airtight container. This recipe makes enough for 3/4 curries. The second Indian spice I made for him to take back was a Garam Masala Powder. Roast each spice in a non-stick pan until warm and fragrant. Cool completely then grind the spices to a fine powder this will keep in an airtight container for about 3 months and then the spices will start to lose their flavour. Use as per your recipe. I always grind my own spices as it is so easy to do they are fresh and much cheaper than buying those small pots or packages with of course additives. I came across this recipe for Gluten Free Banana Pancakes when I was reading blogs this morning and as I have a glut of bananas I thought I have most of the ingredients although I did a little tweak here and there and they were very nice even hubby liked them…Thank you, Bailey, from bites by bai they were lovely. Chopped banana, blueberries, walnuts and maple syrup to serve. Put the banana, oats, eggs, baking soda and maple syrup in the blender and blitz until smooth and well combined. Last night we had Grapow moo with morning-glory which is a lovely Thai vegetable stir-fried with garlic and chillies. Stir-fried Morning Glory or Pad Pak Boon Fai Daeng is also known as water spinach…It is a very popular vegetable dish in Thailand and one I have for breakfast/brunch quite often with rice. This is a very quick dish to cook once you have all your ingredients prepared..5 mins at the most. Wash and cut your morning-glory into 4-6 inch pieces. Heat the oil in a pan until very hot. Add the garlic and chillies and stir-fry ( stirring) for 15-20 seconds be careful not to let garlic burn. Add morning-glory and all other ingredients except for the vegetable stock. Stir-fry for 40 seconds and add vegetable stock and stir-fry for another 10 seconds. This entry was posted in Carol Cooks2, CarolCooks2...In my kitchen, Cook from scratch, Uncategorized and tagged Authentic Indian Food, Authentic recipe, Authentic Thai Food, Chettinad Masala, morning glory, Pork and Basil, Stir fries on January 4, 2019 by CarolCooks2. Pingback: CarolCooks2…A roundup of my New Years posts… | Retired? No one told me! Sainsburys own brand is 75% but that has some stabilisers and water in it too. Great post! I particularly am interested in the Masala recipe. It is going on my to do list! Terrific recipes and fascinating to know about the additives in coconut milk…shameful! The flower we grow in the uk isn’t edible….as such. I researched it when I came back from Vietnam having eaten it there. The U.K. Plant is different and The seeds contain a substance similar to lsd and can be toxic.